A couple of months ago, a study on depression among male vegetarians made the social media rounds (1). 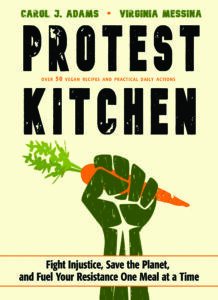 I know from the flurry of emails I received that many vegans were alarmed by the findings. As is often the case, though, the headlines were far more dramatic than the actual findings. The researchers concluded that the study doesn’t resolve questions about whether vegetarian diets increase or decrease risk of depression. But, they suggested that possible risks in a vegetarian diet could be low intakes of omega-3 fats (the ones found in fatty fish) and vitamin B12. They also pointed to low intakes of folate as a potential culprit, but that doesn’t make sense since vegetarians are likely to have folate intakes that are at least as high as meat-eaters if not higher (2). One of the study authors was involved in a different study published just around the same time. It compared people in the UK eating one of three types of diet: a vegetarian pattern, a traditional British pattern (described as a “meat and two veg” diet), or a pattern that emphasized processed foods and sweets (3). This study failed to find any differences in rates of depression among these different groups. Other studies have found that people eating healthier plant-based diets (particularly those that emphasize fruits, veggies and fish) have less depression than those who eat more western type diets (4-6). One explanation could be lower levels of inflammation associated with plant-based diets, since chronic inflammation may be a risk factor for depression in some people (7-9). At any rate, figuring out causation is tricky in studies of diet and depression. For example, diets high in processed foods are linked to depression, but maybe it’s because people who are depressed gravitate toward unhealthy comfort foods. When we look at cross-sectional studies (which examine the link between diet and depression at a particular moment in time) it’s hard to tell if people are eating Oreos and Fritos because they’re depressed or if they’re depressed because they’re eating Oreos and Fritos. 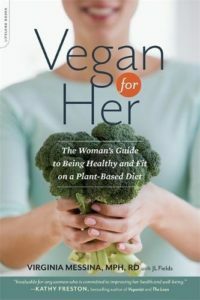 Still, the evidence allows us to make some dietary recommendations for vegans who suffer from depression. It may be that plant-based diets have advantages for reducing depression, but those advantages are sometimes cancelled out by shortfalls of vitamin B12 and omega-3 fats. 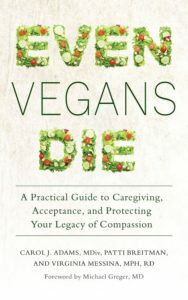 I shared guidelines for vegans who suffer from depression a few years ago, and I think they are still relevant. You can see that there’s nothing fancy here; it’s really just about eating a healthy vegan diet –one that minimizes refined carbohydrates; emphasizes healthy fats, fruits and vegetables; and ensures adequate vitamins B12 and D. Which are all things you should do whether you suffer from depression or not. Keep in mind, though, that it’s not all about diet. In the vegan world, we tend to put a lot of emphasis on food, sometimes forgetting that there are other factors that are equally (or possibly more) important. These include exercise, stress management, social engagement, getting adequate sleep – things that are important for everyone but maybe especially animal activists. Finally, some vegans who suffer from depression need therapy or medication to manage it. To suggest that anyone suffering from depression just isn’t eating right is unfair, unkind, and unsupported by scientific evidence. Tweaking your diet to make it a little bit healthier (and especially making sure you are meeting nutrient needs) can be helpful in dealing with depression. It’s not a proven cure, though, and we need to always take a cautious and compassionate approach in talking about ways to manage depression and other mental health problems. Hibbeln JR, Northstone K, Evans J, Golding J. Vegetarian diets and depressive symptoms among men. J Affect Disord 2018;225:13-17. Davey GK, Spencer EA, Appleby PN, Allen NE, Knox KH, Key TJ. EPIC-Oxford: lifestyle characteristics and nutrient intakes in a cohort of 33 883 meat-eaters and 31 546 non meat-eaters in the UK. Public Health Nutr 2003;6:259-69. Northstone K, Joinson C, Emmett P. Dietary patterns and depressive symptoms in a UK cohort of men and women: a longitudinal study. Public Health Nutr 2017:1-7. Nanri A, Kimura Y, Matsushita Y, Ohta M, Sato M, Mishima N, Sasaki S, Mizoue T. Dietary patterns and depressive symptoms among Japanese men and women. Eur J Clin Nutr 2010;64:832-9. Rienks J, Dobson AJ, Mishra GD. Mediterranean dietary pattern and prevalence and incidence of depressive symptoms in mid-aged women: results from a large community-based prospective study. Eur J Clin Nutr 2013;67:75-82. Lai JS, Hiles S, Bisquera A, Hure AJ, McEvoy M, Attia J. A systematic review and meta-analysis of dietary patterns and depression in community-dwelling adults. Am J Clin Nutr 2014;99:181-97. Raison CL, Miller AH. 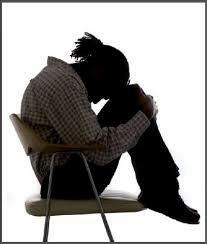 Is depression an inflammatory disorder? Curr Psychiatry Rep 2011;13:467-75. Lucas M, Chocano-Bedoya P, Schulze MB, Mirzaei F, O’Reilly EJ, Okereke OI, Hu FB, Willett WC, Ascherio A. Inflammatory dietary pattern and risk of depression among women. Brain Behav Immun 2014;36:46-53. Haghighatdoost F, Bellissimo N, Totosy de Zepetnek JO, Rouhani MH. Association of vegetarian diet with inflammatory biomarkers: a systematic review and meta-analysis of observational studies. Public Health Nutr 2017;20:2713-2721. This makes sense. 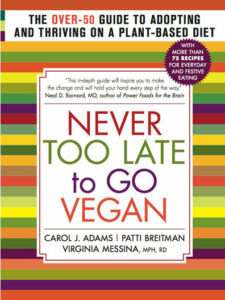 many people seem to adopt vegetarian diets for therapeutic reasons following the emergence of health concerns. It would explain an association between vegetarianism and poorer health. However, when we look at people who adopt a vegetarian diet primarily for religious reasons, it seems that a vegetarian diet may be protective against feelings of depression and poor mood state. This study of 7th Day Adventists looked at people eating vegetarian diets and omnivorous diets and found that vegetarians had better mood states than omnivores. Bah! Just another example of inaccurate and sensationalized reporting of studies! I agree that there are many factors involved in depression, but emotional management is usually key rather than diet. It’s often the case – and most unfairly so – that where there’s vegetarianism or veganism in the equation, all other factors get disregarded. If a meat eater has a cold, it’s a virus. If he has depression, it’s a complex series of factors. If the subject is a vegetarian of some sort, it’s their diet – no other cause allowed. Bah! What evidence is there for that? I always learn something new and useful from your articles. Thank you! Several years ago I was struggling with depression to the point where my wife was concerned. Eventually I tried Omega 3s in the form of fish oil pills and got way better. Then I tried switching to flax oil pills and the depression came back, so I switched back to fish oil. My wife noticed and commented on all these changes. Algae Omega 3s seem to work just as well as the fish oil for me, but they are way more expensive. Lately I’ve been trying to lower my intake of Omega 6, especially oils high in Omega 6 and that seems to be helping with inflammation issues, not feeling “creaky old age” as much as in the past. I’ve read that too much Omega 6 can block Omega 3s and cause inflammation. I wish this were talked about more. I’ve been moving more toward the Whole food plant based way of eating and your web site among others has been very helpful. Thank you! 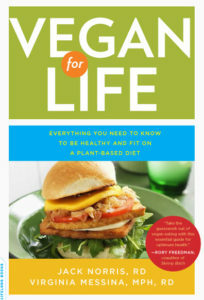 I was vegetarian for over 20 years and now have been vegan for about 2 years. For me, a lot of my depression seems to stem from the sadness, cruelty and simple willful ignorance I see in our world. I don’t have many co-vegans in my life and life in an area of the country that is not progressive at all. My heart is so sad simply from seeing the callous disregard of animals. It seems like no one cares. I hate it. I will always be vegan and I live as cruelty free as possible every day. I think many vegans are depressed because they feel alone and disregarded. Exactly….this needs to be more well known, soldiers come back with PTSD and people try to understand…yet vegans after awhile also have symptoms from everything we see and hear about the horrors of the animals cruelty and how people willfully ingnore this and we have to feel the sadness and helplesess living in such a world where people treat animals in the most horrific ways. We are in a constant state of grief. We are subjected to it daily, within our families ( who eat animals) rodeos, fashion, animal testing, hunting, factory farms, fur farms and the list goes on and on and on….. How can we not feel overwhelmed and depressed??? My heart goes out to you and all the animals. Thank you for bringing up such an important reason why vegans can become so depressed. I don’t know. I was vegetarian and then vegan for several years and depressed as hell. I gave fish oil supplementation a try and it really was positively life-changing for me. I tried other plant based oils to no avail. I’m now pescatarian and feeling much mentally healthier. I know it’s only my anecdotal experience, but anyone wishing to criticize me needs to walk a mile in the shoes of depression. So no judgement here! There are far to many factors when it comes to depression… I’d also like to know what meds the participants took, how much time they spend with their face buried in a smart phone, how much exposure to electro-magnetic frequencies they had, how much TV they watch, what shows they watch, what music they listen to, how many hours a week they work, their spiritual stability…… I can go on and on. But to try and point out the cause of depression in people by pointing to one factor is very narrow minded.